There are also full editing capabilities for Courses, Tournaments and Tours. Challenge your friends on a new or existing course in real time or try to beat their best recorded round.With a myriad of stat tracking, personal bests of others to beat , notifications, challenges and social media integration, you truly have a golf club worth joining. Fine tuned swinging mechanic more about feel and fluidity. We’ve created and fine tuned a swing mechanic that is more about feel and fluidity that goes beyond the users’ accuracy of hitting a marker on a power bar. 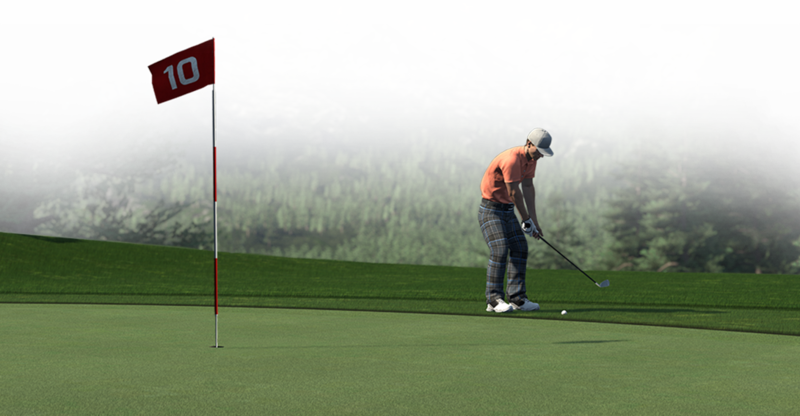 Whilst anyone will be able to pick the controller up and play comfortably, the best players on the global leaderboards will be those with the best feel for the different golf shots and who are able to take into account ball lie, weather and terrain conditions. No loading times means you are straight back on the Tee. No loading times between holes means you are straight back on the tee after sinking your putt on the previous green. Also, minimal loading times into a new course make for a refreshing change to your typical console game. No more getting bored of the courses given to you by the developer. With four clicks, you can generate a unique course never seen before that’s ready to play within any one of the Themes included: from Alpine and Autumn, to Rural, Desert, Tropical, Links and many more. There are currently 11 themes in total and nearly 80,000 courses for users to play! If you have a particular course in mind, (or) want to use your creative skills to create something from scratch or edit something the generator has created for you, the game also has an in-depth editor. 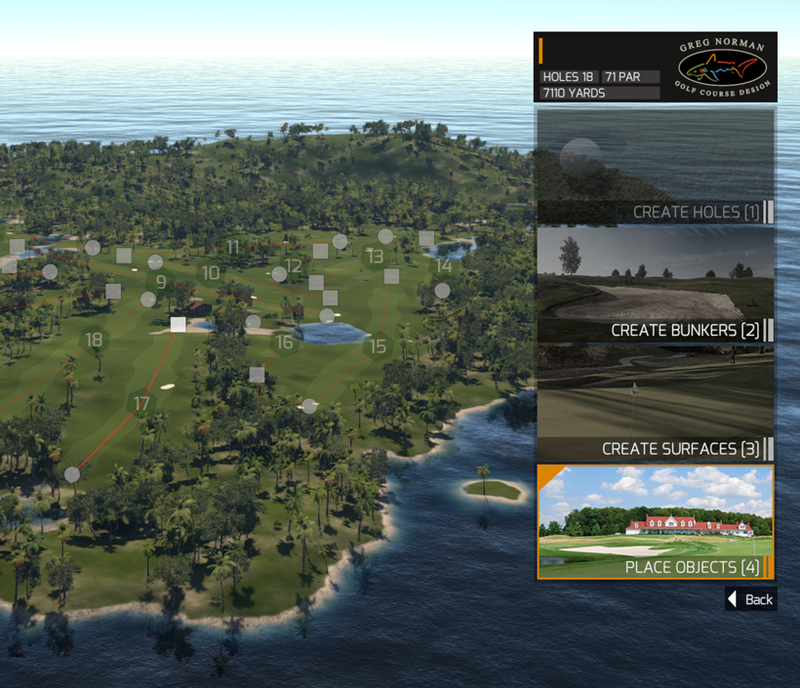 The Greg Norman Course Designer gives you the ability to create from scratch or mould anything on the course. You can alter the terrain, move tees, move greens, move holes, delete holes, add holes, bunkers, rivers, ponds, trees, foliage, buildings, animals and other objects. During editing, you can play the ball from any spot to review holes and make changes as you see fit. The minimal loading times make this practical and enjoyable. No more getting bored of the courses given to you by the developer. With four clicks, you can generate a unique course never seen before that’s ready to play within any one of the Themes included: from Alpine and Autumn to Rural, Desert, Tropical, Links and many more. 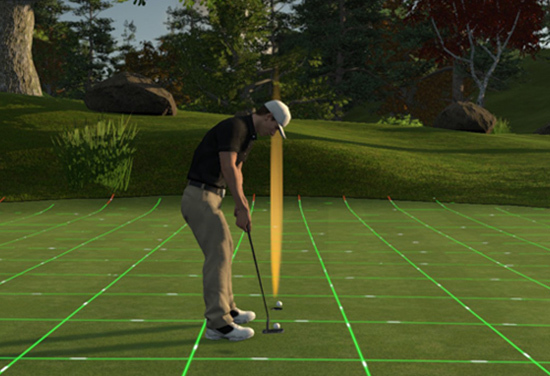 With four clicks of a button from the main menu, the game will generate for you a never been played before course. The variation is infinite! If you don’t like the course that’s been generated, one click and you can generate a new one. If you want to tailor the courses a little more, there are high-level options available to you. Examples of these are the number of holes, par distribution, fairway width, number of bunkers, green size, green slope and rough coverage. With one press of a button, you can interact with these messages. 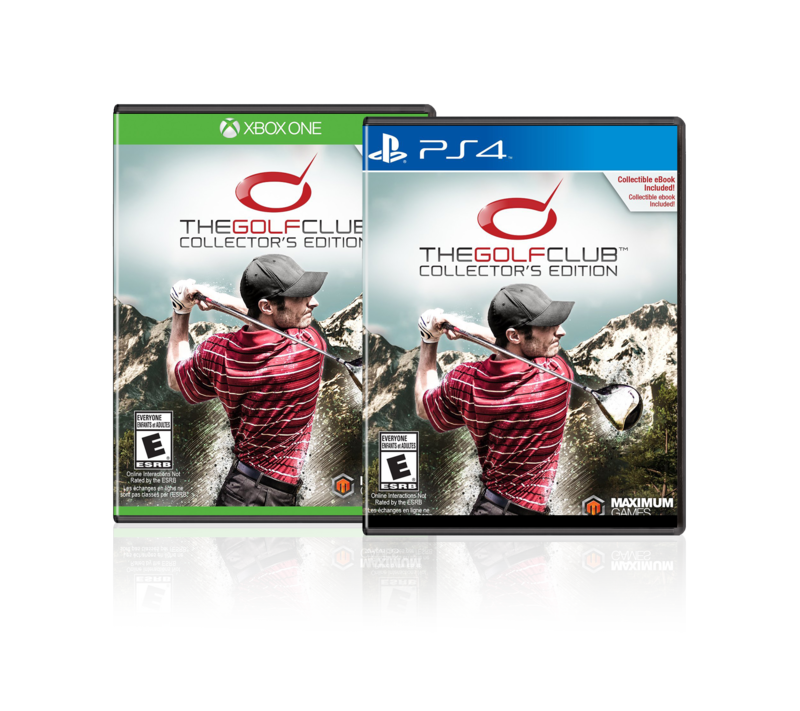 Immediately join your friends on a round or regain your record by jumping to the course and / or hole where the record was broken. All rounds are constantly saved so you can return to your previous game whenever you want to and play from where you left it. Play online against your friends and rivals. 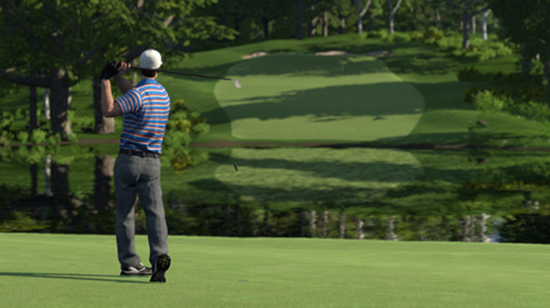 Hundreds of players can be on a course at any time and you can either play your round at your own speed against their Live balls or play turn-based against up to three others. Work your way through the huge database of user created courses, each rated by other users to help make the decision easy to make. When you’re happy with your creations, you can publish them for the rest of the world to play. 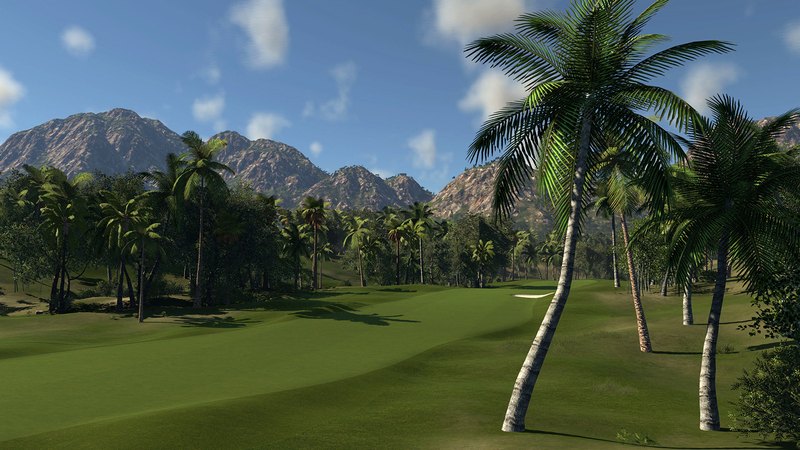 Each round you play on every course is saved online. Choose from Friends Rounds, Record Rounds or Rivals Rounds (others players close to your ability) to compete against. Their ghost balls and scores will be visible throughout your round, giving you the feeling of competition without losing the instantaneous game play. Ghost and live balls can be hidden if so desired, either selectively or en masse. Play against other players throughout the world in user made tours and tournaments. Through our ball trace system, you can see other users from around the world on the course that you are playing live, even if they’re on different holes. Establish and maintain your handicap which represents your ability level and will enable you to compete on a par with any other player in the game. Play on qualified courses to improve your handicap, enter tournaments and tours that have handicap entry requirements and compete against any player of any skill level using Ghost balls, Live balls or turn-based multiplayer.